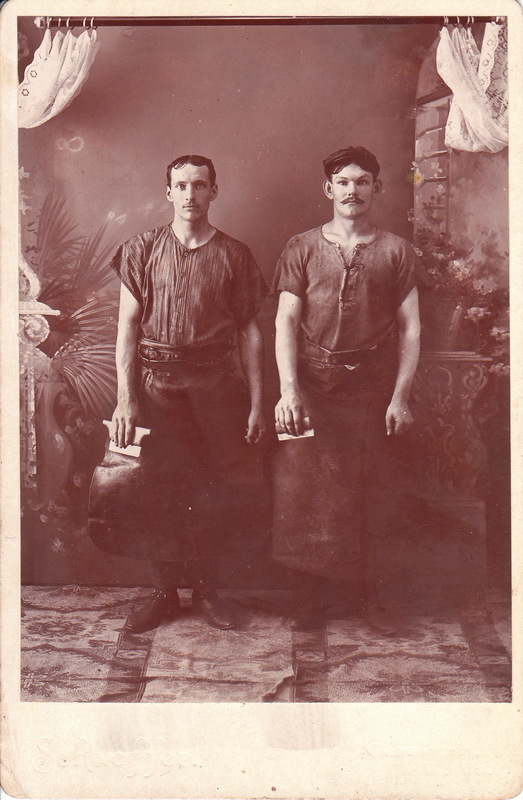 This cabinet card features two men dressed for work and holding some sort of tool or scraper. They appear to be wearing leather work aprons. This is a wonderful example of an occupational cabinet card but unfortunately, it is not clear what these men’s occupation happens to be. It has been suggested that the men may be textile workers. The photographer of this image is John Randolph Schaeffer. He seems to have forgotten that this studio photograph was supposed to depict an outside scene. That is unless it is common to see curtains hanging in the outdoors in Gormania, West Virginia. Schaeffer was born on a Gormania farm in 1858. His family was of German heritage. After finishing school at age twenty, he entered the teaching profession. He pursued his education career for seventeen years; during his last year (1909) he was a principal of a school. During his education career he earned a Masters Degree in Didactics and also did photography. He entered the business of photography after leaving teaching. His studio not only was a photographic gallery, but it also sold photo supplies, jewelry, and other commodities. He was also appointed by President Woodrow Wilson to the position of postmaster for two terms. In his spare time he supported the Democratic party and was a member of Odd Fellows. He married Susie C. Miller in 1894 and the couple had seven children. The Library of Congress lists Schaeffer as holding at least two copyrights. He also published a view book entitled From Baltimore to Charleston (1906). The book was cited by one reviewer as containing “magnificent scenery” photographs. The town of Gormania has had a number of names. Its present name honors a US Senator from Maryland , Arthur Gorman. One of the towns previous names was Schaefferville, named after early settler Jacob Schaeffer (father of photographer John Schaeffer). Jacob Schaeffer and one of his sons owned and operated the town’s first tannery. The business was sold in 1889. We know a lot about the photographer of this portrait but still don’t have any idea of the occupation of the two subjects in the photograph. Lets play “What’s My Line?”. Hopefully, some cabinet card gallery visitors will leave comments with their hypotheses about the type of work the men in this portrait did. My uninformed guess is that the subjects in this photograph are tannery workers.